DURHAM, NC — Unfortunately, just happens in football. After yesterday’s win at Northwestern, two of the star players for the Blue Devils, QB Daniel Jones and CB Mark Gilbert, are going to be out for a while: Gilbert is out for the season and Jones is out indefinitely, per WRAL Sports. Both underwent surgeries on Sunday, as Jones suffered a fractured collarbone while Gilbert suffered what has been described as a freak hip injury. Luckily, Coach David Cutcliffe said that Jones’s injury was not season-ending and thinks that it “will be a much shorter recovery”. Gilbert, an All-American candidate, is an enormous loss, of course, but Jones’s indefinite recovery is a spark of optimism for us. Junior Quentin Harris will need to step up as Jones’s backup in the coming weeks: Duke visits Baylor next Saturday before returning home to face NC Central and, subsequently, VA Tech, who looks to be one of our most formidable opponents this season. Bleed blue, Duke fans. Look on the bright side: our defense looked stout and our offense still has weapons. All is not lost! EVANSTON, IL. — The good thing? We won. The bad thing? The price. QB Daniel Jones got off to the same start that killed the Wildcats a year ago, but at the beginning of the fourth quarter, he went out with an apparent shoulder injury, though collarbone seems to be another outlook, which isn’t good either. Mark Gilbert, our star cornerback, was helped off with a hip injury and could not put weight on his left side. Both players could face long-term injuries, which is a potentially tremendous issue for the entire season’s outlook. Coach David Cutcliffe said that Gilbert will be out for “quite some time” and Jones’s injury “doesn’t look great”. This is just awful. Losing either player would be a major blow to the Blue Devils: third-year Jones started the season looking better than ever, holding a completion percentage of more than 74% and throwing a whopping 3 touchdown passes in one quarter this afternoon, plus a 7/0 touchdown-turnover ratio in the first two games. while Gilbert had an ACC-leading six interceptions last season and is one of the best cornerbacks arguably in college football. It appears that Gilbert will be out for most, if not the remainder, of the season. In addition to Gilbert and Jones, center Zach Harmon, a veteran voice on a young, developing O-line also had to be helped off the field for a leg injury, while Jeremy McDuffie was unable to participate as well. Not much good you can say about the game. We played wonderfully. The offense rolled, Quentin Harris wasn’t bad and didn’t turn the ball over. The defense was stout throughout the game even after losing Gilbert and deserves respect. Our thoughts are with the injured players for a speedy recovery. Bleed blue. Duke will visit a familiar face this weekend: they’ve had a thing going with the Wildcats for a while and beat them pretty handily last year (they hadn’t otherwise) but Northwestern is good again and will be a really tough opponent, especially on their home soil. For one thing (and no diss to Army) there’s a pretty big step up in the quality of the D-line, and Duke’s young offensive line needs to step it up to protect our quarterback. Daniel Jones thrived on the run-pass option play last year and absolutely befuddled the Wildcats’ linebackers. This year, without some key guys on the offensive line, that won’t be so easy and the offensive line will be a vital part of our success. 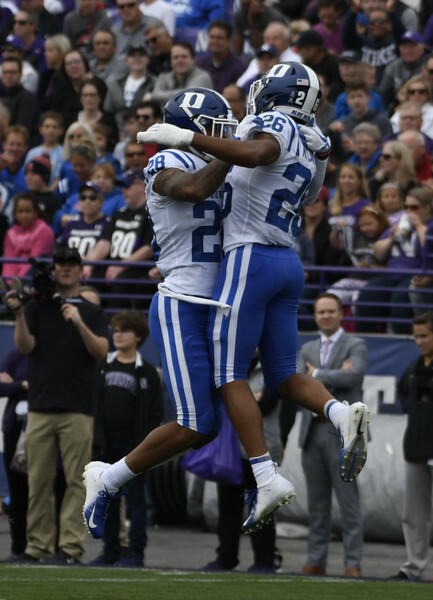 Last year Duke kept their offensive guys on the field, and while tiring, that was rewarding as it kept the NU offense off of it. The Northwestern offense is good but extremely inconsistent from the small sample we’ve had. That or Purdue really locked in on defense: in week one, the Wildcats scored 31 in the first half alone and then were held scoreless in the second half of play. The Boilermakers didn’t get quite enough offense going and Northwestern won, 31-27. It’s really difficult to go from 30 minutes/31 points to zero. I have no idea what happened but the only thing we need to be sure of is that they don’t score 31 in the first half in the first place. They also play two quarterbacks, so Duke has both of those guys to worry about. Offensively, Brittain Brown should play after last week’s little scare, which eliminates lots of worries for one of Duke’s star players. I’m confident in both the offense and defense for the Blue Devils. We just have to get both rolling to limit and then hit the Wildcats where it hurts them (football-wise). InsideNU is thinking vengeance (and lots of other comments about my hometown, our students, and our football program simply because we kicked their rear ends last season). We’re thinking validation that last season’s dub was no fluke. Bleed blue. Both teams played very hard, as expected from the two schools, but in the end, Duke had the upper hand. In their opening game Friday night, Duke defeated Army West Point in a somewhat validating redemption game. Duke’s last loss of last season, the last of their six-game losing streak, was to the Black Knights, in a 20-16 shocker. The offense was amazing, especially for the first game of the season. TJ Rahming has brought in an improved game even from last year’s breakout, while Brittain Brown is probably one of the best if not the best player on the team. Personally, I was there. The stadium was electrified, and some new effects were added for this season, like flickering lights. Not to mention the crowd when Zion Williamson and Nolan Smith showed up on the jumbotron. Daniel Jones with the 1-yard QB sneak TD, but this was the play that set it all up. A 60 yard BOMB to Aaron Young. His legs, too. He had some good decisions to run in the game as well. Brittain Brown was the star of the show, and there was a scary moment where Brown went down in the 3rd quarter. Brown walked out of his own accord after apparently injuring his knee, however, and while Coach Cutcliffe later said that he would be sore following the injury but the trajectory was fine. He actually did return during the game but did not make any carries. Joe Giles-Harris also left the game, but he said he cramped, plain and simple, so while painful, it’s nothing serious. Bleed blue. Sorry about the late post. #DukeGang is back!